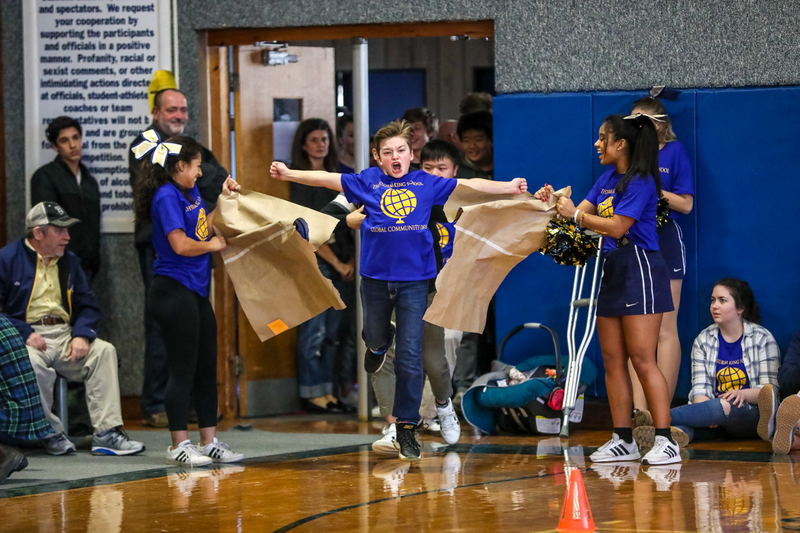 Storm King School spirit was higher than ever as the school community kicked off a busy weekend of sports with a winter pep rally! The event, which took place on Friday, February 8, in the gym, celebrated SKS’ winter athletic teams and recognized the efforts of our student-athletes, captains, and coaches. 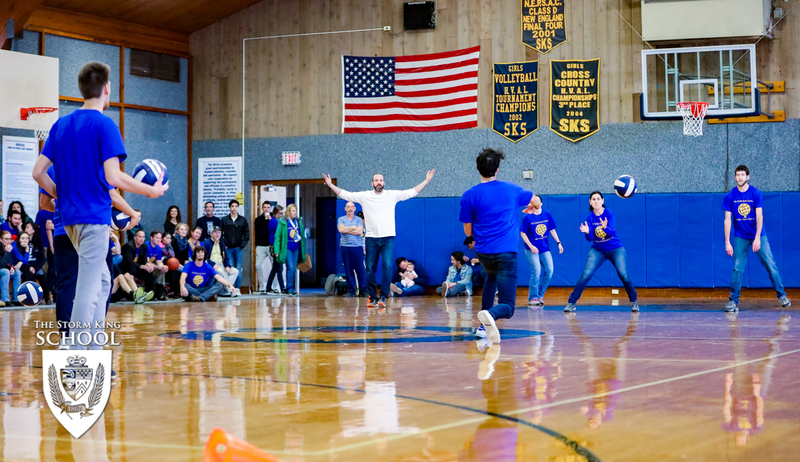 The fun began as faculty and students played dodgeball and free throw and the SKS cheerleaders revved up the crowd. 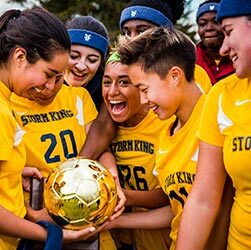 Then, each of Storm King’s seven winter athletic teams made a dramatic entrance to the gym as their coaches and captains called out their names, including Esports– SKS’ newest addition to the varsity sports roster. The spectators cheered wildly as each team burst through their banner and lined up on the gymnasium floor. 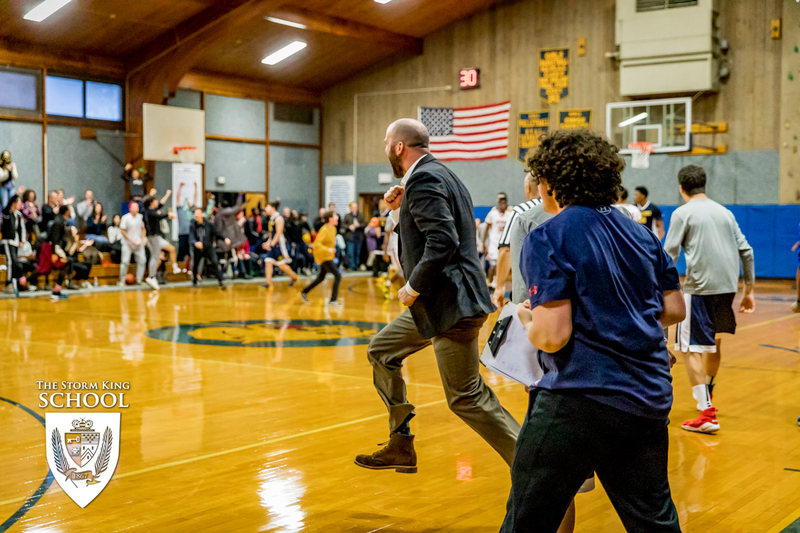 The excitement peaked with the appearance of the girls varsity basketball team, who were gearing up for their last home game of the season versus Poughkeepsie Day School immediately following the rally. The spirit of the crowd helped carry the girls to a win and helped all of our teams get winning results this weekend. The SKS boys varsity basketball team claimed the first-ever Mid-Winter Invitational with a thrilling 64-62 OT victory over crosstown rival NYMA. The game went back and forth down the stretch with the deciding basket being scored by senior Samuel DeSouza within the last 30 seconds of the overtime period. 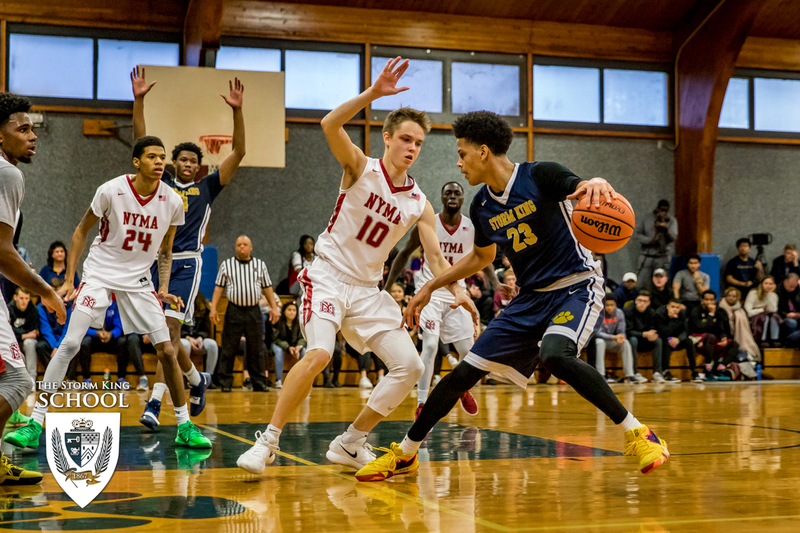 The Cougars advanced to the title game with an 80-60 semifinal victory on Saturday afternoon versus St. Andrew’s School in Providence, RI, while the NYMA Knights cruised to victory over the Hoosac School to set up the grudge match. All-tournament honors went to Desouza and his fellow senior Denys Bobchuk, but every player who saw the floor made key plays to help the home team win the day. Complementing the success of the varsity team, the boys JV squad made the journey to Kildonan School in Amenia, NY, for the Kildonan Classic Tournament. During their game versus Woodstock Country Day School on Friday, February 8, the JV boys gained momentum early on the clock but ultimately fell to their opponents 62-36. However, the team came back in force on Saturday to defeat Woodhall School 45-30. The win placed them third in the tournament overall. The excellent performances of Dekai Steven Xu ’23 and Chi-Yuan Wilson Shih ‘20 earned them both Storm King All-tournament honors. It was also a winning weekend for the girls varsity basketball team. Following the pep rally on Friday, February 8, Storm King hosted its league opponent Poughkeepsie Day School in the last scheduled home game for the team’s 10 seniors who were recognized before the game for their dedication and sportsmanship throughout the year. Storm King emerged victorious, winning 36-22, led by seniors Shania Roehrich, Cat Zheng, and Coco Chen, and junior Sam McCullough. On Saturday, February 9, the team traveled to Marvelwood with the goal of beating a tough league team and returning quickly in time for the Snow Ball dance that evening. They did just that. SKS won a tough game 47-37 thanks to strong play by captains Shania Roehrich and Cat Zheng as well a gritty play by seniors Tiana Vazquez, Maria Fedosenkova, and Maya Nazarkasimova. These two wins put SKS at 4 – 3 in its league and 7 – 6 overall to date. The team’s two remaining games are away against Poughkeepsie Day School on February 13 and at Darrow School on February 16. Storm King’s 8th and 9th-grade wrestlers also had a successful weekend when they traveled to a junior high tournament at the Eaglebrook School in Deerfield, Massachusetts on Saturday, February 9. The day was highlighted by a second place finish in his weight-class by Javier Arena Irrurita ’22 and strong performances from David Moure Hernandez-Coronado ’22 and Luke Ciunga ’23 who each picked up one win apiece. The wrestling team is in action again on Wednesday, February 13, when they host teams from the HVAL in a quadruple meet.